Note: this is less of a review and more of an analysis of the film Prometheus. Plot spoilers abound. Read with caution if you haven't seen the film yet. Imagine: a science-fiction film that explores the origins of human life by exploring extraterrestrial worlds, painting the image of mankind as both created and creator, our own technology betraying us, all while asking deep philosophical questions against the backdrop of immense visuals. I've just described Stanley Kubrick's seminal sci-fi film 2001: A Space Odyssey. I've also just described Ridley Scott's Prometheus. Essentially, Scott and Co. have mashed-up 2001 with Scott's original science-fiction masterpiece, Alien. These are two of the best sci-fi films ever created, so you'd think that Prometheus would be a sci-fi tour-de-force. But it's a bit like combining a fine Pinot Noir and stirring it into a rich espresso drink; they're delicious and satisfying apart, but lose their beauty and subtlies when combined. The scientists encounter an alien technology that no one on Earth has ever encountered before (except for the cave drawing people, perhaps), and so they do exactly what the most brilliant scientists from the future would do: they act like imbeciles. One decides to immediately take off his space helmet and take a deep breath of air. On. An. Alien. Planet. Who knows what alien spores, viruses, or toxic elements just entered his lungs, but he doesn't seem to mind. So the other scientists follow his example. "He's fine," they think. "Sure, this goes against the very basics of the scientific method. But we don't mind; this is only the greatest discovery in human history. Which we should probably verbally remind ourselves every so often, just in case there's an audience observing us." This moronic move sets the tone for the rest of their actions; they open doors, they push buttons, they carry decapitated extraterrestrial heads into their ship without any real sense of quarantine protocol, and they abandon two disoriented scientists to spend the night in the foreboding environment. These two strays could have radioed the ship or the other scientists in order to find their way, but that wouldn't have kept the plot going, now would it? So they find themselves with a new alien life form that appears agile, strong, and quite aggressive. So one of them chooses to poke at it. You can imagine what happens to him. Nearly every character's action or inaction elicits a single important question: why did he/she do that? The motives and methods behind actions seem confusing at best, and completely contradictory or haphazard at worst. Why is there a multi-million dollar piece of surgical equipment only intended for males located in the cabin of a female character? The android, David (brilliantly portrayed by Michael Fassbender, who might be the only interesting character in the whole bunch), brings back a black alien goo and infects a crew member with it. Why does David do this? While this victim succumbs to the infection, another infected character becomes an unstoppable menace, essentially killing off the nameless crew members of the ship in order to have a legitimate action sequence in the film. Why does the alien goo kill one character and strengthen another? And why did the alien engineers create this goo in the first place? It is suggested that it was a biological weapon intended to destroy humanity. So why destroy humanity using a weapon that also destroys its creator? Why place the location of this weapon lightyears away from the species you want to destroy? And why spend the time and energy communicating with this species--over the course of a few thousand years, if the cave drawings are accurate--where this weapon is located in space? And what does this have to do with the Alien movies again? Now, I don't mind when movies raise questions and don't answer them; in fact, I rather like a good bit of mystery and paradox. But it does matter that these unanswered questions be important ones, and not just the result of sloppy philosophical babble in the writing. Prometheus causes its audience to be filled with a myriad of questions, but none of them are the ones it is actually trying to ask. While I am in full support for world-creation in stories, especially worlds that contain interesting ideas in philosophy and spirituality--even ideas that are unChristian--these filmmakers have crafted a movie that attempts to purposefully target a Christian worldview. 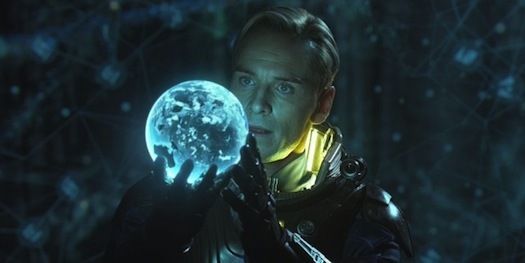 From the origin of life being aliens instead of Divine, to Elizabeth's apparent Christian faith being the underlying joke of the film, to Ridley Scott's inane claim that one of the alien engineers was Christ himself, Prometheus feels intentionally anti-Christian in its ideas. Follow with me here: the events in Prometheus occur at Christmas. The central character, a barren woman named Elizabeth, finds herself miraculously pregnant through the means of the maker(s) of humanity. But instead of faithfulness and eagerness about her new offspring, she performs an abortion. Instead of a savior, she births a monster. What does this central scene say about the filmmaker's views of Christian theology? Maybe I'm reading too much into this, and I'm certainly not one to be defensive about the portrayal of Christianity in films, but Prometheus feels a bit like a needless attack. Visually, Prometheus is stunning. From the set design to the CGI environments, the images on the screen will inspire awe and wonder. Yet its plot, characters, themes, and ideas are all a disappointing mess. Ridley Scott was certainly ambitious with this film, but his ambitions didn't pay off for this viewer. Scott has suggested that this film is just the beginning in a series. I think I've had my fill of this filmic wine/espresso concoction.